Happy birthday, Amitabh Bachchan! As the Bollywood ka Shahenshah celebrates his 75th birthday on the beaches of Maldives, we would like to take a moment and thank him for having delighted us with an array of throwback pieces. Be it a Throwback Thursday or Flashback Friday, fans and followers rush to Big B's social media feed to always find some blast from the past. It's not just the senior Bachchan but his actor son Abhishek is also responsible for making us nostalgic. 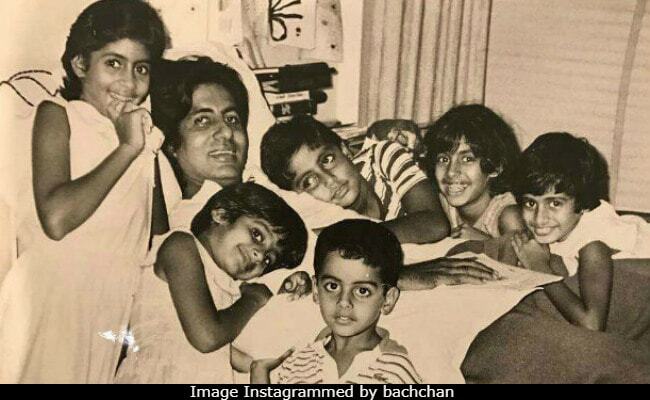 From the sets of Big B's iconic movies like Amar Akbar Anthony and Sholay to vintage-hued memories from family photo albums, all feature on the Bachchans' Instagram. Here's a look at the 10 best posts from and/or starring Amitabh Bachchan that has made us happy, ranked in order. We'll start with the one starring the "Bachchan bunch," comprising Shweta and Abhishek Bachchan and their cousins. This is from sometime in the mid-eighties, when Big B was hospitalised while shooting for a Manmohan Desai film and the kids had paid him a visit. #throwbackthursday taken in the mid 80's ( 1985 if memory serves). I call it Big B and the Bachchan bunch. Dad was hospitalised with Mysthenia Gravis and my sister, cousins and I had gone to visit him. Being too young to understand what all was going on our parents always made it out to be like an outing so that we would not be disturbed by the hospital and its workings. When I used to visit my father after his accident on the sets of "Coolie" in 1982, seeing him connected to many drips and machines, he used to tell me they were kites that he had got for me. I was 6 yrs old. My father was fighting for his life and all I thought about was... why isn't he allowing me to play with these kites??? The innocence of childhood I guess. This is what Amitabh Bachchan shared to commemorate 40 years of Amar Akbar Anthony. Big B co-starred with Rishi Kapoor and Vinod Khanna in the cult comedy. Here are Big B and Dharmendra as harmless looking criminals. "Two very keen, committed, interested artists on the sets of Sholay, the jail sequence," Big B captioned. And then, he had the best caption for Jaya Bachchan from when she was not married to Big B yet. This photograph is over 40 years old now. #throwbackthursday the day i was brought home for the 1st time from the hospital. That's a-couple-of-days-old me in my dadima's arms. This was captioned the most DAD-way ever. That is Abhishek a few minutes after birth .. and then before you know it he becomes a strapping 6'3" lad .. kids I tell you ..
Flashback to 1950. Amitabh Bachchan photographed in his Allahabad mansion on 17, Clive Road. Can you identify the little kid on the left as Amitabh Bachchan? Yes, it's him. Which one of the photographs did you like the best? Tell us in the comments below.